TASHKENT, Uzbekistan (JTA) — As a new immigrant with little savings and no guaranteed income, Mikhail Davidov had no hope of getting a mortgage to buy the $900,000 house in Queens, New York, he now calls home. Luckily for Davidov, a 42-year-old hairdresser who immigrated to New York six years ago from Uzbekistan, he never needed a mortgage. Davidov’s story is typical of the tradition of mutual assistance that experts of Bukharian Jewry say is key to the community’s remarkable success in business and maintaining their unique customs and lineages long after most Bukharian Jews left their homelands in Uzbekistan, Tajikistan, Turkmenistan, Kyrgyzstan and Afghanistan following the Soviet Union’s collapse. By the 1990s, the vast majority of approximately 100,000 Bukharian Jews had left Central Asia, where they have lived at least since the 15th century, for Israel, the United States, Austria and Moscow. Today, only 3,000 of them remain in Central Asia. Concentrated mostly in the three Uzbekistani cities of Tashkent, Samarkand and Bukhara, Central Asia’s Bukharian Jewry is a graying community with hope neither of replenishing their numbers nor the social status they enjoyed up until the previous century. At one time they dominated the region’s textile and dye industry, according to Giora Pozailov, a historian at Israel’s Bar- Ilan University specializing in Bukharian Jewry. Bukhara once was a major stop along the Silk Road, which in ancient times connected Europe with Asia. Now the southern desert city has so few Jews that its two synagogues almost never open simultaneously to ensure at least one has a minyan, the obligatory quorum of 10 men required for some Orthodox prayers. Even so, Shabbat prayers stretch on for hours as a handful of congregants wait for suburbanites and late risers to arrive on foot. Draped in prayer shawls, the men practice their deep, guttural singing of scripture as they sit in pews in the main synagogue’s yard — a cooler alternative to the stuffy interior, which can reach 104 degrees Fahrenheit in summer. The women used to sit apart from the men in the synagogues, on an elevated balcony, but have since moved downstairs with the men because climbing the stairs became too difficult for elderly congregants. The only growing Jewish institution in Bukhara is the community’s walled-off cemetery. “This community has no future here,” says Shirin Yakubov, a 33-year-old mother of three. 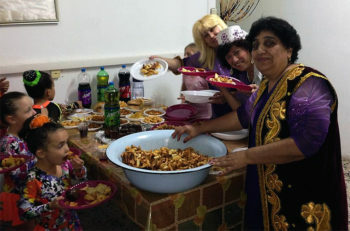 Yakubov is one of the few young members of Bukhara’s Jewish community of 150. 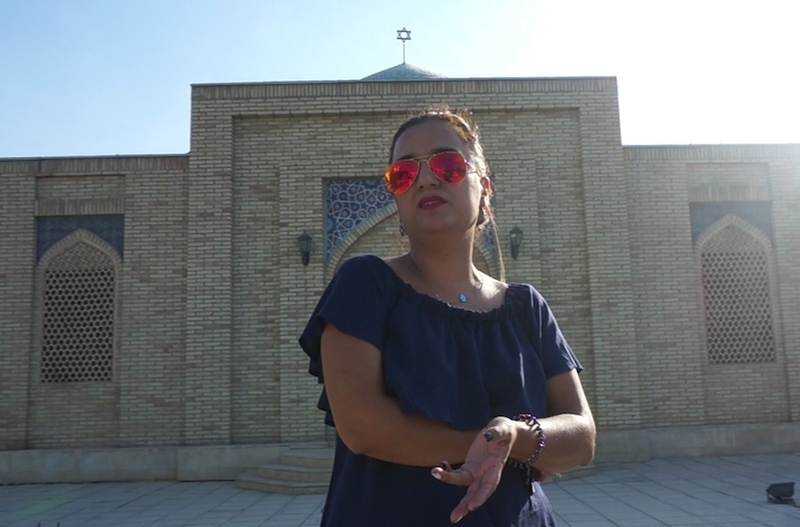 Her three siblings all live in Israel, where she and her husband, Arsen, plan to immigrate as soon as his elderly parents also agree to leave. Meanwhile, their children attend a Jewish school where only a few of some 200 students are Jews. Both synagogues feature pictures from the 1997 visit to Bukhara of Hillary Clinton when she was first lady – part of an eclectic display of ornaments hanging on the their walls that include china vessels, portraits of community sages and, somewhat depressingly, an array of nonfunctioning clocks. Whereas time seems to be running out for the Bukharian Jews of Central Asia, their communities have produced for themselves a new and extraordinary lease on life in Russia and the West. Despite arriving with meager funds to competitive societies where Jewish communities are fast assimilating, Bukharian Jews have managed to rebuild congregations that stand out in their level of prosperity, robustness and cohesiveness, according to Pozailov. Among the best-known and most successful Bukharian Jews is billionaire diamond magnate Lev Leviev, an Israeli philanthropist who has spent millions of dollars in donations to institutions that experts on Bukharian Jews say keep the community from falling apart outside its homeland. Leviev is funding predominantly Bukharian schools, such as the Ohr Avner Jewish School in Elmhurst, New York, which opened in 2002 and “where young members of the community can meet spouses and study about their heritage,” Pozailov said. Thanks to donations from Leviev and others, the community in the United States has several newspapers, including the Russian-language Bukharian Times weekly. The Queens community even has a museum – an amenity that the remnant community in Uzbekistan lacks. In Vienna, where hundreds of Bukharian Jews settled in the 1970s, members of the community now dominate the kosher food and catering business. And in Israel, their outsize stake in the country’s $6 billion diamond industry, among other sectors, has turned them into the quintessential Zionist success story. Living on the Silk Road “has exposed Bukharian Jews to international skills, principles of trade, different cultures and perspectives that mean that, today, business runs in their blood,” Pozailov said. Zeev Levin, the head of the Hebrew University’s Central Asian Research Unit, takes such assertions with a grain of salt, citing the lack of scientific research on Bukharian Jews’ levels of income and their alleged immunity to assimilation. Others cite the experience of similar ethnic “niche” groups whose economic success depends on mutual support, not cultural inheritance or genetic advantages. Yet there is little doubt that compared to other Jewish communities, Bukharian Jews have done a good job in preserving their heritage. In communities as far-flung as Australia, young Bukharian Jews are taught the community’s distinct customs and history, like the controversial 18th-century exchange of the Persian prayer style for the Sephardic one. Bukharian Jews are originally thought to have arrived in the region as exiles from Persia and perhaps, according to community lore, as Israelites expelled from the Holy Land. This emphasis on preserving Bukharian culture and language (many community members speak Bukhori, a dialect of the Tajik-Persian language) has created an environment conducive to preserving intimate traditions, according to Pozailov. One such custom involves the exchange of personal greetings between couples on Passover. They serve one another the first of four cups of wine drunk during the Passover seder and present their wishes for one another. The Queens Bukharian museum, located at the Leviev-funded yeshiva in Queens, includes traditional garb such as the jumah – a gold-threaded, colorful plaid kimono-like robe worn by men on major Jewish holidays. While significant, Leviev’s help is “but one of several factors that make Bukharian Jews a unique community, which has managed to re-create itself and prosper in conditions that broke most other Jewish communities,” Pozailov said. Nestled among predominantly Muslim populations that even Joseph Stalin did not want to alienate unnecessarily, Bukharian Jews suffered less of the anti-religious and anti-Semitic persecution that befell their European coreligionists living in the former Soviet Union, he noted. Before that, the social isolation of Jews under the region’s Muslim rulers — they imposed special taxes for Jews, forbade them to ride horses and made them wear a patch on their clothes — cemented Bukharian identity by the middle of the 19th century, when czarist Russia took over the area and freed its Jews. The takeover ushered in a golden age for Bukharian Jews, when capitalists like the Vadyaev brothers reached a near monopoly of the cotton industry before they were dispossessed of their fortunes following the Bolsheviks’ rise to power. To Elyahu Ludayev, a Samarkand-born dentist and amateur historian from Tel Aviv, this unique history is responsible for making Bukharian Jews “one of the few non-haredi Jewish communities that is not at risk from assimilation,” he said. Henry Gerber recalls that he and I saw in the Holocaust museum in Skokie, IL the yellow star that Hetty Delueewe wore as a child under the Nazis before she was hidden, and the Bible she was given by the Dutch Christian family that hid her during the War. Judy Patkin writes, "I'm so sorry to learn that Hetty Deleeuwe was ill and recently died. She was a supporter of us for many years - even after Chicago closed their Soviet Jewry office. I remember meeting her at some UCSJ meeting years ago. I always think of her as a lovely person. We're so lucky that the Holocaust didn't claim her along with the millions who perished." Meylakh Sheykhet writes, "Boruch Dayan vo Emes. Such a painful loss. Hetty was an extraordinary personality. Always ready to find a solution for only good, sensitive to every pain and suffering, always with great attention to every telephone call. May she rest in peace among the righteous and pray for us in this world to enable to continue to what she was an important part for years." Morey Schapira has a followup on the Survivor Mitzvah Project: He forwards a response from Efraim Zuroff of the Simon Wiesenthal Center's Israel office: "It's run from LA by a Jewish woman, who worked in the entertainment industry for many years, named Zane Busby, who established it after visiting Lithuania. As far as I know, it is a very well-run and effective organization."